Web-based tools can guide you to existing data, help you analyze your measurements, map your watershed and its resources, and provide critical watershed information. These are some we recommend. Indiana HUC Finder - Find the 8, 10, and 12-digit hydrologic unit code (HUC) for any location. Also shows the older 11 and 14-digit HUCs on the same map. 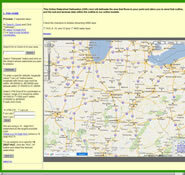 Indiana Watershed Group Finder - helps you find active watershed groups anywhere in Indiana. 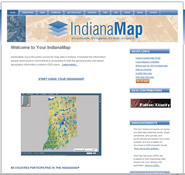 Discover who is monitoring what parameters in Indiana. This metadata tool does not contain actual data but points you to data holders. Developed in collaboration with the Indiana Monitoring Council. Read the Fact Sheet. Find out how Indiana agencies are monitoring water. This wiki-based tool provides links to many protocols not previously online. 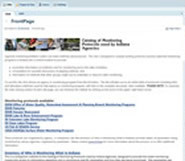 This site helps facilitate communication between current Indiana Watershed Leadership Academy participants, alumni of the program and the public on the subject of watersheds and watershed management. 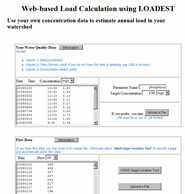 Use your own concentration data to estimate annual load in your watershed. Developed by Purdue University. Provides more than 200 spatial data layers through a simple web-based interface. Developed at Indiana Geological Survey, in collaboration with the Indiana Geographic Information Council. Delineates the area that flows to a watershed outlet, and allow you to send that outline and the soil and landuse data to the online L-THIA model. Developed by Purdue University. Works within ArcGIS Explorer (free software from ESRI) to provide water quality data from IDEM’s AIMS database. Developed by ESRI through a contract with the Indiana Department of Environmental Management. Uses your data to calculate estimates of nutrient and sediment loads and load reductions that result from implementation of various conservation practices. Uses daily stream flow to quantify the frequency and rapidity of short-term changes in stream flow. Developed by Peter Richards and David Baker, Heidelberg College. Visualize and understand water flow across America. Streamer allows you to trace America's larger streams upstream to their source or downstream to where they empty. Streamer is fueled by fundamental map data for the US at one million-scale from the National Atlas. If you have corrections or other suggestions, please contact Laura Esman, Purdue University. 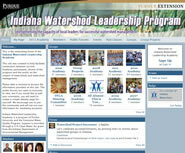 Indiana Watershed Leadership is a program of Purdue University. Support is provided through a 319 Clean Water Act grant from the Indiana Department of Environmental Management. Thank you to members of the task team that contributed to the development of the Indiana HUC Finder: Jane Frankenberger (Purdue University); Sara Peel (Indiana Lakes Management Society); Jan Sneddon (Earthforce GREEN); Eric Stallsmith (Indiana Outfitters); Elizabeth Trybula (Indiana Association of Soil and Water Conservation Districts).